Chesterfield High School basketball practice has ended. One year later the town is still reeling from the massacre of a brutal mischief night murder, but even the statewide curfew won't stop these teens from pulling pranks on Hallow's Eve. 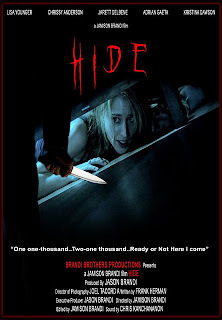 Susie Hauser, head cheerleader along with her teenage friends are lured by a psychopath to play a revengeful game of hide and seek on this anniversary night. For a high school senior and her friends, the childhood classic becomes a deadly game of survival. Who will play? Has one of their own turned on them? Who will hide and who will seek?